NASA image created by Jesse Allen, using Landsat data provided by the United States Geological Survey. Caption by Rebecca Lindsey. North America’s deepest river canyon is not the Grand Canyon on the Colorado River, but Hells Canyon on the Snake River in the Pacific Northwest. The eastern rim is higher than the western rim, reaching an elevation of 8,043 feet (2.5 kilometers) above river level—more than a quarter of a mile deeper than the Grand Canyon. Hells Canyon follows the state line between northeastern Oregon and western Idaho, and the river and much of the surrounding terrain are wilderness and national recreation areas. 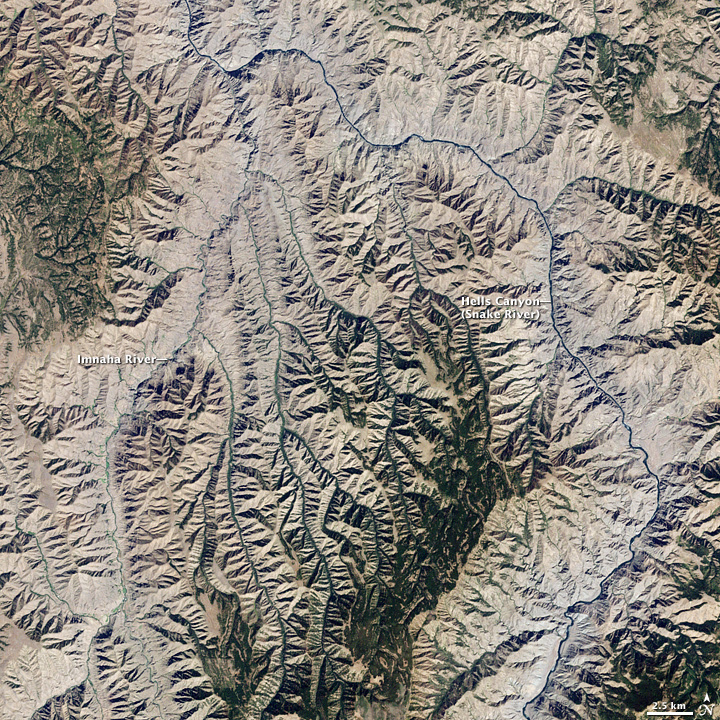 This natural-color image of Hells Canyon was captured by NASA’s Landsat-7 satellite on September 19, 2002. 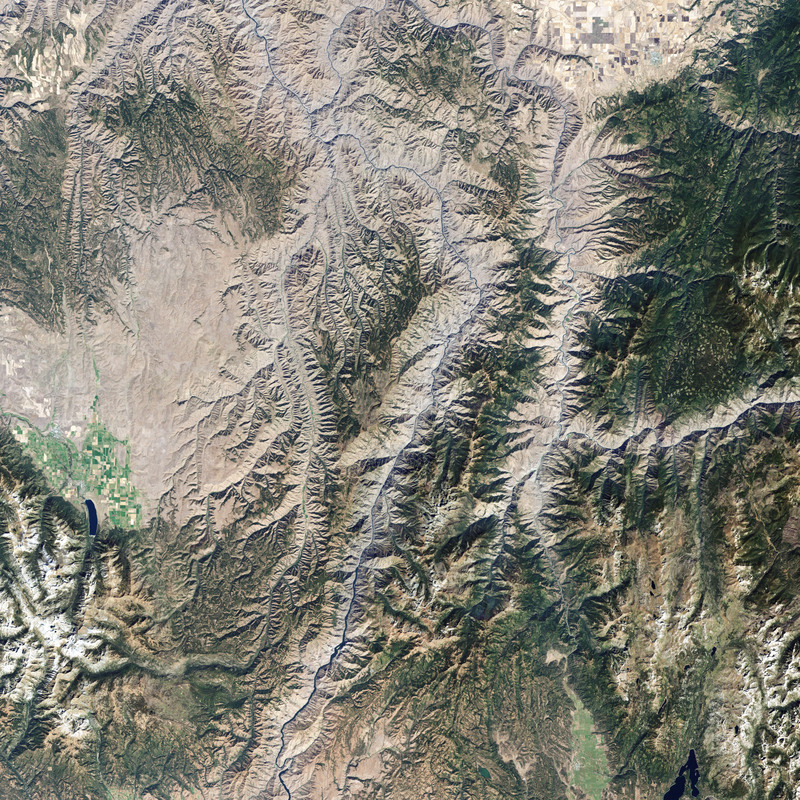 The image shows the northern part of the canyon, where the Imnaha River joins the Snake River. (Both rivers flow north.) The landscape is a mixture of green vegetation in gullies and along creeks and pale beige-gray, where the grasslands that dominate Hells Canyon have likely gone dormant in the heat and dryness of late summer. In places, the canyon walls are bare cliffs. The geologic history of the rocks of Hells Canyon begins 300 million years ago with an arc of volcanoes that emerged from the waters of the Pacific Ocean. Over million of years, the volcanoes subsided and limestone built up on the underwater platforms. The basins between them were filled with sedimentary rock. Between 130 and 17 million years ago, the ocean plate carrying the volcanoes collided with and became part of the North American continent. A period of volcanic activity followed, and much of the area was covered with floods of basalt lava, which smoothed the topography into a high plateau. The Snake River began carving Hells Canyon out of the plateau about 6 million years ago. Significant canyon-shaping events occurred as recently as 15,000 years ago during a massive outburst flood from Glacial Lake Bonneville in Utah. USDA Forest Service. (n.d.). Geology of Hells Canyon. Hells Canyon National Recreation Area Website. Accessed March 6, 2009. USDA Forest Service. (n.d.). Hells Canyon Overview. Hells Canyon National Recreation Area Website. Accessed March 6, 2009. USGS Cascades Volcano Observatory. (2003). Lake Bonneville and the Bonneville Flood. Accessed March 6, 2009. World Wildlife Fund. (2007). Palouse Grasslands. Encyclopedia of Earth Website. Accessed March 6, 2009.